An accident has taken the life of an 8-month-old baby boy in an early morning accident when an automobile and pickup truck collided. Representatives from the Arlington Police Department said that the crash happened around 9:30 AM May 29th on South Cooper Street. Authorities from the police department said the pickup was heading south on Cooper as Daniel Bingenheimer pushed his infant son David in a baby stroller. When Bingenheimer got to the end of the street, he stopped and waited at the intersection with his son. A vehicle attempted to make a left turn just as he began to walk into the intersection. David was pronounced dead at the scene of the accident. Daniel was taken by ambulance to a local hospital with non-life-threatening injuries. Police said that they currently are undecided as to who is at fault in the tragedy. However, eyewitnesses say at the car had run a red light, smashed into the back of a pickup truck, then swerved into the Bingenheimers. The drivers of both vehicles were transported to area hospitals with minor injuries. The driver of the car was reported to be a woman who appeared to be in her 40s. Daniel’s wife, Chelsea, arrived at the scene of the accident shortly after it happened and was clearly upset. She is reportedly six months pregnant. 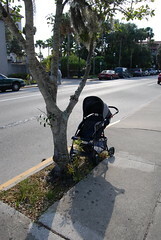 Area residents said that Daniel would often walk the same route with David in the stroller almost every day and appeared to enjoy taking the regular leisurely walks with his son. Nothing in the world can ever compare to the tragic loss of a loved one; especially a child. If you or a loved one have been injured in an accident involving we can help. Give our offices a call and we will match you with one of our experienced attorneys. Expenses can add up, and we are there to protect your rights. Get the best representation available and in your corner Contact us at the Dallas Car Accident Lawyers today.